Batman Action 14 oz. Ceramic Mug:Quench your thirst for justice with the Caped Crusader! This Batman Action 14 oz. 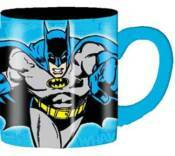 Ceramic Mug features an image of the Dark Knight in a Neal Adams 80's style. Ceramic mug holds up to 14 ounces of liquid. Hand wash only. Not dishwasher safe. Do not microwave.